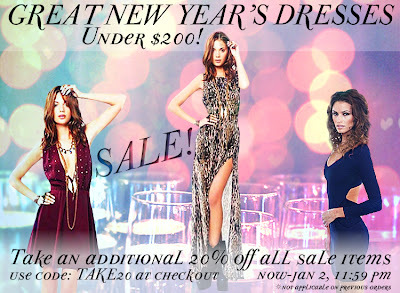 Great New Year's Dresses Under $200! Looking for the perfect New Year's Eve dress? Look no further! Ambience has got the best selection of party dresses, and with our new markdowns you can find the perfect cocktail dress for under $200! And with our Post Holiday Sale, you can also take an additional 20% off all sale items now through Wednesday, January 2, 11:59 pm by using coupon code TAKE20 at checkout! We've got new markdowns, and endless savings!